With our deadline of June 12th has come and gone, we extended the registration to June 14th to give our last minute folks a few more days to register. We had to deliver our final counts to the facility today, June 14th, at 1PM and had to close online registration. If you do still plan on coming to the conference, there is a Walk-In fee of $100 for the Thursday, June 21nd Conference which will be charged as we have to call the facility to make special arrangements. As for Wednesday June 21st, the bus tour is sold out and the Dinner registration is also closed. We are still accepting folks for the Walking Tour/Film Festival on Wednesday. 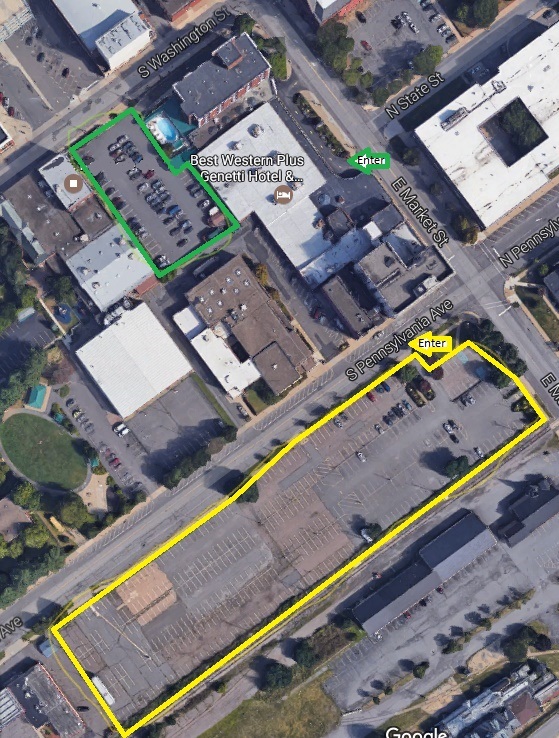 The Main Parking Lot for the Genetti Conference Center can be accessed off South Pennsylvania Ave (the area circled in yellow). An entrance to Genetti’s is just across the road from the entrance to the parking lot or you can walk around to the East Market Street entrance where the registration table will be. For those of you staying overnight at the Genetti Hotel, the hotel guest lot is in the back of the hotel (the area circled in green). It is accessible from East Market Street by the Conference Center entrance. The AMR Conference Committee has been hard at work sorting out details related to the Program and we have a working draft posted to the Program Page. We have also confirmed a few more speakers and posted their presentations to the Presentations Page. Just an aside, we have had a limited number of seats open up for the bus tour at the last minute. If anyone is interested, please contact Michael Hewitt at (570) 371-3522 or hardcoal@epcamr.org. As of this morning, we have met our max of 40 attendees on the tour bus. There is still the Walking Tour / Film Festival available on Wednesday. If you were still interested in the bus tour, we have been asked to make a waiting list. You may contact Michael @ hardcoal@epcamr.org to be added to the waiting list. We may not know if someone gives up their seat till much closer to the conference or even the “day of” the tour. Bus Tour is almost Full! As of today, there are only 5 seats left on the bus tour. The tour is first come first serve, meaning we take orders based on the time they were submitted. Please register for the conference sooner than later to assure you have a seat on the bus! There is also a walking tour/ film festival going on Wednesday if you miss out on the bus tour registration. Please see the tour page for more details. Please visit our Registration Page to see all the options for Exhibits, Wednesday Tours, Dinner, and Thursday Conference. This year’s registration is “a la carte” style meaning there is no “whole conference” rate. Attendees must purchase the Tour, Exhibit, Dinner, and Conference items separately. There are links to help you find these items and build an order on the EPCAMR Online Store. The AMR Conference Committee met recently to approve another round of speakers. Please see the Presentations Page for more details. We also updated the Program Page to show the basic backbone of the conference and when certain things are happening. More details will be added when we start placing speakers in the time slots. Don’t forget to visit our Sponsors Page to see who has stepped up to the plate to make this conference possible (and especially cost effective for our attendees). We updated the tour page just recently. Please have a look at the 3 different options that are available: Bus Tour, Walking Tour / Film Festival and Self Guided Tour. The 2017 PA Abandoned Mine Reclamation Conference will be held June 21 & 22nd at the Best Western Genetti Hotel in downtown Wilkes-Barre. The Conference Planning Committee decided on the theme of “The Future of Reclamation in PA”. The conference is going to be located in the heart of the Wyoming Valley and the Northern Anthracite Coalfields. We have not been back to “The Diamond City” since our first regional conference that was held in June of 1996 at Wilkes University. 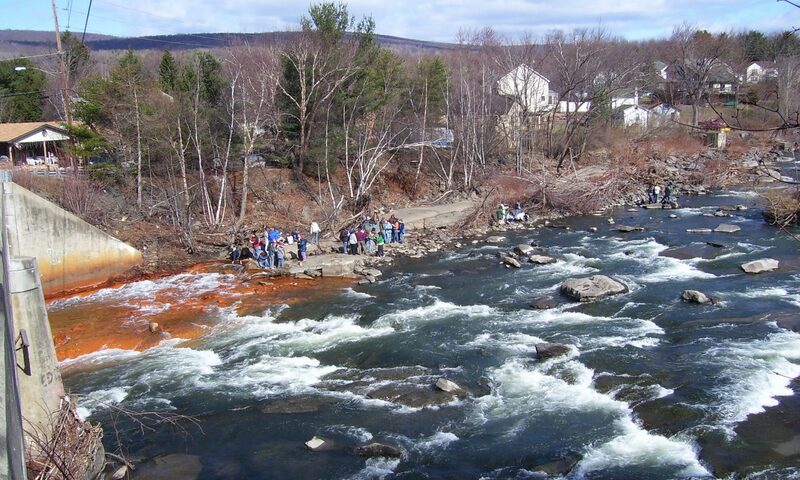 We are planning a full day tour of the Wyoming and Lackawanna Valleys’ abandoned mine drainage (AMD) and abandoned mine reclamation (AMR) projects. We will share success stories, present challenges and highlight economic development construction projects on abandoned mine lands. Discussions will be held on the future of abandoned mine reclamation in PA and how we are going to address the countdown to the sunset of the Abandoned Mine Land (AML) Trust Fund: a fund created in 1977 by a small fee levied per ton of coal mined via the Surface Mining Control and Reclamation Act to address economic and environmental devastation due to historic mining issues. We anticipate hearing about the Governor’s agenda for the environment in relation to abandoned mines and reclamation. A new Federal administration will have already been set in motion. The future of coal mining directly affects the AML Trust Fund, not only in PA, but nationally. We need to continue to talk about economics, job creation potential, community revitalization, economic redevelopment opportunities, recreational opportunities, the decline of coal mining, the design and construction of mixed use industrial parks and educational opportunities for future workers (our youth) as we look to transition the Commonwealth’s degraded abandoned mine landscapes into new regional economies. What does the future hold for abandoned mine lands in PA? Well, our tour and presentations will highlight those benefits and give our attendees a firsthand look at progress and projects that have been made over the last few decades as well as some serious challenges in the Anthracite Region with some very large multi-colliery AMD discharges (upwords of 100 CFS, 45K GPM or 65 MGD depending on your preferred units of measure). The surrounding watersheds of Luzerne and Lackawanna County have their challenges, but they also have had opportunities that were taken to improve the local environment, land, and streams impacted by AMD. We’re hoping that EPCAMR’s very own Program Manager, Michael Hewitt, will be able to have time to present over lunch on what he learned on a “once in a lifetime opportunity” tour with the Heinrich Böll Foundation around Germany’s anthracite and lignite mines to see how their economic sectors justly transitioned away from coal into more sustainable power base. The Foundation is a catalyst for green visions and projects, a think tank for policy reform, and an organization that maintains an international network of partners of which EPCAMR is now a part of. It is sure to make an excellent photo montage presentation of the places he visited showcasing the innovative conversions of former coal industry buildings and transformation of mine lands into technical parks and recreational landscapes connecting the formerly disjointed communites, if we can relieve him from some of his more technical duties that he has maintained so often for us at previous year’s conferences. The Pennsylvania AMR Community is a very active constituency working on mine drainage issues and supporting the reclamation of our abandoned mine lands across PA. Given our strength in the number, we are the ones who are taking back and reclaiming our communities in more ways than one and securing multiple sources of funding to do so and we have always appreciated the role and funding that the Commonwealth of PA has provided to support these efforts as our partner. Our ultimate goals collectively are many: clean water, reclaimed viable landscapes, sustainability, improved quality of life, job creation, local economic redevelopment opportunities out of mine-scarred lands, development of new energy sources, hydro-electric energy, geothermal energy, continued support of ARIPPA’s high-tech cogeneration plants for electrical generation and coal refuse bank removal, re-use of mine pool water to save fresh water reserves, creation of fish hatcheries, and the re-use of metal oxides for multiple markets. How we are going to get there collectively is what the Conference will discuss in the present. So, this year we are going to incorporate our ideas, successes, and partnerships into presentations and discussions that will model how the PA AMR Community can proactively address the future reclamation of PA’s abandoned mine lands, rivers, streams, and communities impacted by past mining practices. Please fill out our mailing list form.